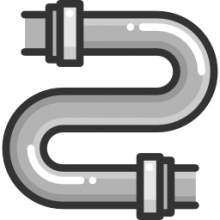 Flexible ducting is a type of duct used generally in HVAC systems. 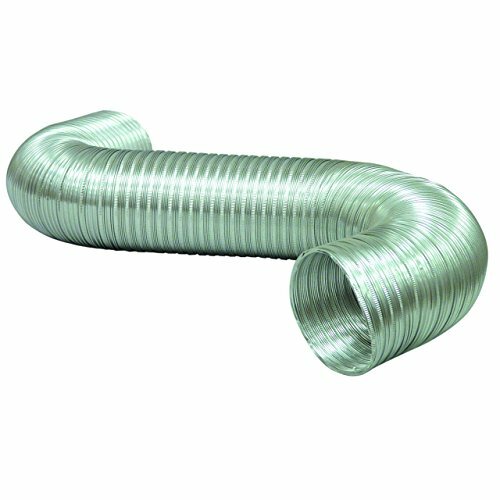 Flexible ducting is advantageous for installation applications in particularly tight and curved building spots. Whereas traditional and standard ducts wouldn't be able to fit, flexible ducting lets you bend it around difficult circular areas of the building structure. Another advantage of using flexible ducting is that it can be more energy-efficient, while also making sure that home and building air quality is up to snuff. The TerraBloom aluminum and plastic-layered duct is our top pick- it ships with a pair of metal clamps and comes in 4", 6" and 8"diameters, expanding to 25 feet long. Users say that it is easy to expand and contract, which means that you will not have to do too much trimming- and that the clamps were perfectly sized for installations in server rooms, kitchens, bathrooms, drying machines and more. Let's take a look at five of the best-selling flexible ducts on the market today and see how they compare. This 2 lb., Dundas Jafine Flexible White Vinyl Duct is a solid flexible duct that is ideal for general-purpose exhaust application. Users like how much easier it is to use compared to metal ducting, but some had a problem with a smell that it gave off. The Dundas Jafine is composed of white vinyl and measures 4” x 20″. It is not meant to be used on dryers. It can be used for such things as bathroom fans and surface mounted humidifier units. One purchaser measured the circumference with tailor’s tape and it came to just under thirteen inches. Buyers really seem to like the heavy duty quality and one user said that they could see it lasting between five and ten years. Some purchasers of the FD420ZW liked that it was light and easy to work with. Outside of some buyers complaining about it giving off a bad smell, most other negative reviews based on things it’s not meant for such as attaching it to a dryer. 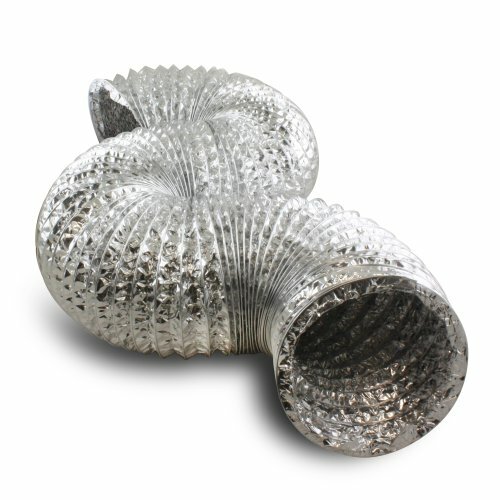 This flexible ducting is an inexpensive option for those looking to use it for a small range. This 6.5 lb, Deflecto aluminum duct is a good semi-rigid, but flexible, duct that is made of fire-resistant aluminum. Users like how, with careful application, the ducting is very easy to use, but it will tear if you are not gentle with it. The Deflecto Aluminum Duct is meant for multiple uses such as bathroom and kitchen venting. The majority of users said that it will not reach the eight feet that it says it will. Many say that if you try to get it to the full eight feet that it will start to tear or fall apart. Some buyers of the Semi Ridgid Duct said that it is thicker than they thought it was going to be, in a good way, and that it worked great for what they were trying to get done. Other buyers, on the other hand, had problems with the durability saying it was made of poor material, and that it fell apart real easy. Others said that it was actually thin material and only worked for certain jobs, such as ones that only call for it using about five to six feet worth of duct. This aluminum duct is an okay choice if you are working with something that only calls for a short amount of duct. This 3 lb., TerraBloom aluminum duct is a solid flexible ducting option that is designed specifically for ventilation purposes. Users like how good the airflow is and how durable the duct is, but caution that it is has to be handled with care. The TerraBloom will reach twenty five feet when it is fully extended and is prepared for easy installation with any six inch inline fan. The Aluminum Ducting is also pretty easy to cut using metal snips or regular wire cutters. Purchasers love that it is not made of a cheap material and is easy to work with. One reviewer writes about how easy it is to expand and contract, and commends its ability to install around bends. Many of the customers used the TerraBloom for replacing their old duct and others talked about how it doesn’t tear easily (in a good way). From the limited amount of negative reviews, most complained that they thought it was too thin and the quality was not good. 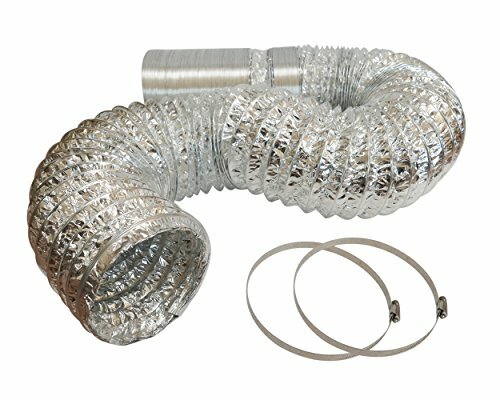 This flexible aluminum duct is an inexpensive choice for anyone that is in need of a ventilation duct. 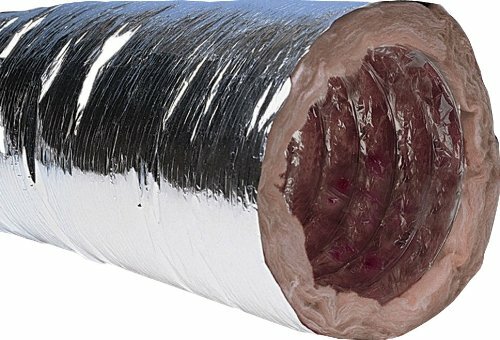 This 10 lb., Speedi-Products insulated flexible duct is another good insulated flexible duct option. It comes with a polyethylene sleeve that separates airflow from the insulation. Users like how easy it is to work with and how good the quality is, but it might have a strong glue smell to it at first. The Speedi-Products FD-25R4 can be used for standard, return, and supply exhaust systems. One user used the flexible duct for their bathroom exhaust fan and said that it was easy to work with and did its job well. Another purchaser mentioned they used it for a portable indoor A/C unit and like not only how easy it was to work with, but said that it also made the A/C quieter. Another user also said that it helped muffle the fan noise. Another buyer who did not like the product said that it was flimsy, messy, and that it dropped itchy insulation all over the place. 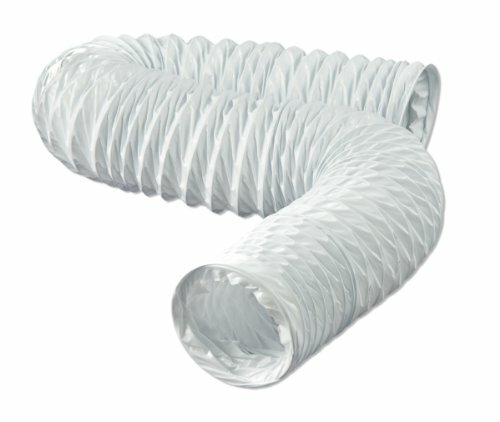 This insulated flexible duct is an inexpensive option if you are looking to use it for new jobs or to replace old duct. This VenTech Aluminum Duct is a great aluminum ventilation duct, with many users opting for professional installation in unenclosed areas. Users love how durable, yet flexible, the VenTech was to work with, but needs to be used with care when making you measure your cuts. The Duct-6 VTD625 can be used for jobs involving air, fume removal, dust removal, green room cooling and more. One buyer used the ducting for their greenhouse and said that it worked great and they did not have a problem with it. Another purchaser said that it holds both hot air and cold air really well, but you should measure multiple times before you make a cut. They also recommend using metal snips to make the cut. A few users said that they had problems with pin holes when they received the VenTech, one user saying that it has strong aluminum and metal wire, but is useless with the holes. Most buyers did not have a problem with holes and more than a few compliment how light it is making it easier to work with. This aluminum ventilation duct is a high quality, inexpensive option for anyone that work requires it. Flexible ducts can be composed of different sorts of materials- there are some of them that are made from aluminum laminate while others are made from steel wire helixes, which particularly contribute to ducting flexibility and durability. In some cases, contractors and builders will install polyethylene vapor barriers around the duct to facilitate energy conservation in home and business building environments. Another advantage of flexible ducting is that for the most part you or the service professional will not have to cut or fix it. Tools-free installation can be a real time-saver when installing ducting. When purchasing a duct, be aware that generally they are manufactured and designed to meet general safety standards that include relevant air-quality regulations. Many of them advertise they are eco-friendly, as well, so be sure to scrutinize the ducting product specifications to determine exactly what makes them eco-friendly and what safety standards they are equipped to measure up to. Another common issue with flexible ducting is that ultraviolet light has the potential to damage it- making the ducting brittle or breaking it if it is installed in the proximity of lighting systems. Most manufacturers will specify whether the flexible ducting, whether it be a flexible heating ducts, air duct, flexible round duct, or insulated flexible duct can potentially be damaged by ultraviolet light. Another important point of consideration is whether the flexible ducting you purchase comes insulated or on insulated. While insulated versions can help you and the home or business owner conserve energy while maintaining clear air, if it is fiberglass insulation it is not formaldehyde-free, which some dislike. Some flexible ducting has antibacterial material insulating it- this is designed to ensure that fungus and bacteria do not proliferate inside of the duct. These flexible ducts are pretty modern nowadays, and are easy to bend and install in areas like attics, crawlspaces and grow rooms where space is really tight. Though many of them will not require any tools to install, if the duct is a bit too long for your purposes you can easily cut it down to size. In all, these are pretty malleable, low-cost, adaptable items that are ideal for a variety of household and business environment installation applications.